A beautiful setting on the Oregon Coast. A pristine, sheltered beach, tidepools galore, wildlife in the water, woods, and air, hikes that lead to superb vistas up and down the coast. It’s a weekend at the beach, with music and friends old and new. It’s always sunny at Westwind, AND it almost always rains. Which is to say, any weather can happen. A growing, family friendly community. More than a fourth of those who attend the Westwind Weekend are young people. Kids bring their friends. They dig in the sand, play Frisbee, hike, play cards, dance, play music, drink hot cocoa, help out, hang out, and build lasting memories. Non-stop music jams. At any moment you’ll find swing favorites on the front porch, old-time in the shed, and Irish/contra tunes in the kitchen. Some of the finest musicians in the Willamette Valley come to Westwind and are joined by folks just learning to play and everyone in between. Contra dancing and more. Friday and Saturday evenings feature the Westwind All Star Orchestra playing tunes, and dance programming that’s aimed at all ages and abilities. Expect family dances, contras and squares, and a set of Scandinavian favorites. Also find musicians jamming and swing or zydeco dancing underway outside the main hall. Camper-led workshops. Gumboot dancing, daisy chain squares, swing chords, beach talk, favorite folk songs: come with your special talent to share or learn something you’ve never heard of before. Sunday morning expect time for singing the gospel of our non-denominational love of community. A Saturday camper concert. Enjoy listening to the crazy, creative, and sublime as your fellow campers perform, or put together your own high or low art performance and step up onto the whale bone stage. Happy, hearty vegetarian food. Beth Littlewolf has been our cook for 25+ years. She makes wonderful fare that brings us all together in the historic Wilson Lodge for family-style meals. Meals at Westwind include snack Friday evening, breakfast, lunch, and dinner on Saturday, and early-wake up breakfast fare plus brunch on Sunday. Classical guitarist, composer, singer-songwriter, innovator of the 19 string arch harp guitar, James Kline is an artist who constantly renews and reinvents himself. As a classical guitarist he studied in Spain under a full scholarship from the Spanish government. There he won a number of international awards, including the Ramirez Prize of Santiago de Compostella and the Tarrega Pize of Benicasim. He holds an ARCM diploma from The Royal College of Music of London and has performed throughout eastern and western Europe as well as the United States and Mexico. He has also gained recognition as a composer and was awarded an Individual Artist Grant in music composition from the Marin Arts Council of California. As a singer-songwritter, James draws inspiration from a slightly more unusual life experience which includes years working as a commercial fisherman, working as a wilderness guide, extensive travel on four continents, and living among Mexicoï¿½s Tarahumara Indians. An interest in Renaissance and Baroque music led him to design his own version of the eleven string arch guitar, an instrument which combines the best qualities of the lute and the guitar. The urge to expand his horizons and dedicate more time to composing led James to co- found the neo Celtic group Bardou with whom he performs regularly. 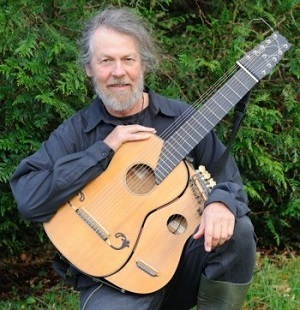 He has again reinvented his instrument to become the worldï¿½s only player of the 19 string arch harp guitar, a combination of lute, guitar, and Celtic harp. A modern day troubadour, his performances reflect a wonderful diversity of life experience and musical intrigue and are often punctuated with story telling. Doors open 6pm with a potluck reception. A house concert is an excellent opportunity to hear great music in a very intimate setting. Sing, play or enjoy hearing great 70’s songs. Come and go, as it’s a party. Extraordinary instruments and heartwarming music rooted in the Nordic, Celtic, and American folk traditions. 98 strings on stage! Science tells us that cross pollination can result in hybrid vigor that transcends the sum of its parts. In a parallel vein, the vibrant West Coast traditional music community has given birth to the New World String Project. Four highly skilled and well known multi-instrumentalists have joined forces to create an exciting weave of music rooted in the Celtic, Nordic and American folk traditions. Ancient and modern sounds mingle freely on Swedish nyckelharpa, Celtic harp, fiddle, guitar, cittern, bouzouki, and more. Join the New World String Project for a musical ride that will shake your boots, uplift your spirit and warm your heart. Original and Traditional, harmonized poetry songs, lots of humor. Go to https://lisalynne.com/cedarhouse-concerts/ for location details. A house concert is an excellent place to hear and meet great musicians in a very intimate setting. A young Sicilian artist left Italy over 30 years ago, with the dream of “playing with the greatest guitarists”. Peppino has achieved his dream and he’s now firmly planted in the “who’s who” of the guitar world. Peppino D’Agostino emerged on the acoustic guitar scene in the early 80’s as a leading member of the second wave of the great fingerstylists that helped redefine the instrument in the ’90s. His remarkable technique, penchant for open tunings, and percussive effects are the basis of his unique compositional style which has been inspiring musicians and audiences alike for decades. Add to that his natural warmth, playfulness, and broad musical tastes and you have the recipe for what he calls “minestrone music”. His virtuosity and his emotional charge have also had a significant influence on the younger generation of fingerstyle guitarists. 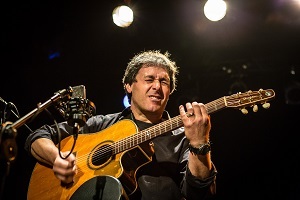 D’Agostino continues to evolve and grow in ways that would have been hard to predict when he first showcased his melodic yet emotionally intense style on the recordings Acoustic Spirit, Close to the Heart, and Every Step of the Way which was named one of the top three acoustic guitar albums of all time by Acoustic Guitar magazine readers. FAR-West, one of five regions of Folk Alliance International, celebrates folk music through our annual conference. We invite you to join us this October — to listen, celebrate, recognize, and enjoy the richness of folk music in the West. 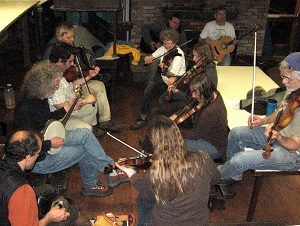 Our regional conference offers an affordable, intimate and interactive way for acoustic artists and presenters to focus on the folk community in the western region of the US and Canada. Join us for four days of music, learning and connecting. We welcome a wide variety of styles, levels and disciplines, encouraging musical and cultural diversity and excellence.